Not a lot going on here this week, except a whole shed-load of indecision. In my own defence I have made a quilt back and gathered together what I need for two others, and have prepped all the bits to catch up with my 365 circles (I am 8 behind). But nothing more. My problem, such as it is, is that I can't decide what to quilt next. I have a scrappy top up and running, but want to alternate that with something else. Previously I have just picked up the next in the queue, which is purely a chronological decision, and got on with the job. But...the next one should be Quiet Quilt (top left) and I'm a bit less than in love with it right now, so I'm tempted to pick something else, but that requires me to make a choice. These are the four I have waiting and there's a good chance that this time next week I will have got no further! So, to sum it up, less slow Sunday sewing than endless Sunday dithering. You can't go wrong with choosing any of these. Pick the one that is calling you the loudest, and if none of them are calling you, just grab one at random. I'm not sure why you don't like the quiet quilt because that is the one that spoke to me first when I looked at those pictures. I also really like the bottom right. I would just go for it and move on to the next quilt as you have always done. Therefore the decision is made for you and you are at least moving forward. They are all so pretty. 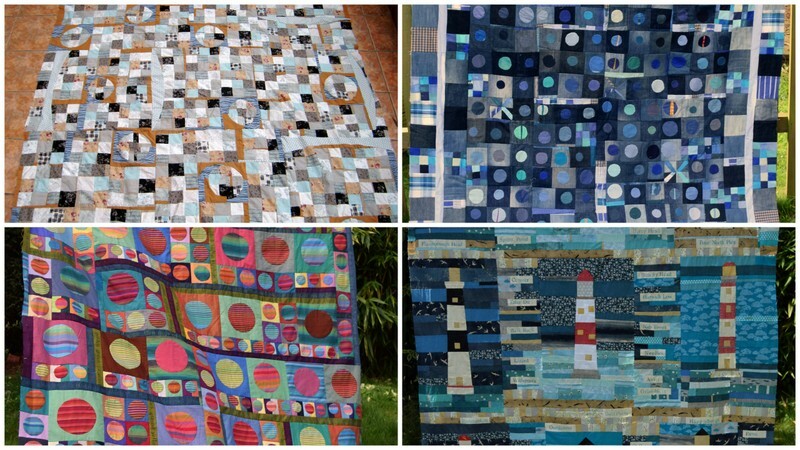 The quiet quilt is one of my very favorites (lighthouses ARE my #1). Perhaps no new quilting for a bit is actually the answer for right now? All such pretty quilts. I'd quilt the easiest first and then hopefully that will motivate you to do the rest! I love all of them, but I really believe that you have to enjoy the project you're working on every moment. So why not put the quiet quilt in time out for a bit and when you see it again, you will be totally in love! ... decisions... decisions! Look forward to seeing what you decide on! I do love both your quilts with the circles, the bottom left is my all time favourite and I can't wait to see this all quilted. Hope you decide before your next weekend post! Just pick one and get 'er done! I can see using some fun colors of quilting thread on the quiet one to add more interest to it. If you don't make a decision you will lose a whole week of quilting! I hope you can make a decision soon. If the quiet quilt isn't pushing any bells at the moment just let it rest. You mustn't feel guilty because you're not following your usual routine. Be a devil! Go on; choose one of the others! The planets are calling so loudly I can hear them here, on the other side of the North Sea! My favorites are the two at the bottom. But take your time and hear which one is whispering to you : it´s my turn. I've always said life gives us way too many choices these days. Write names, numbers on paper and then rough them up together and get someone else to,pick one out! Yes I dither quite a bit myself. Alternate between the circles and the lighthouse? The bottom two. They are different in style and colours. That's a great idea to make a quilt back while dithering. I've been a tad indecisive myself and could do with a 2 or 3 quilt backs to finish some stuff off. If that's dithering, then I must be at a dead stop! Either way, I do dither quite more than I should. The summer is over and I'll start school on Monday and can't say that I've done much of anything. You, on the other hand, have been steadily working on several projects and they all look fabulous. It must be difficult to decide which one to finish up first.